What are the causes and risk factors for renal artery stenosis? What are the signs and symptoms of renal artery stenosis? What are the exams and tests for renal artery stenosis? 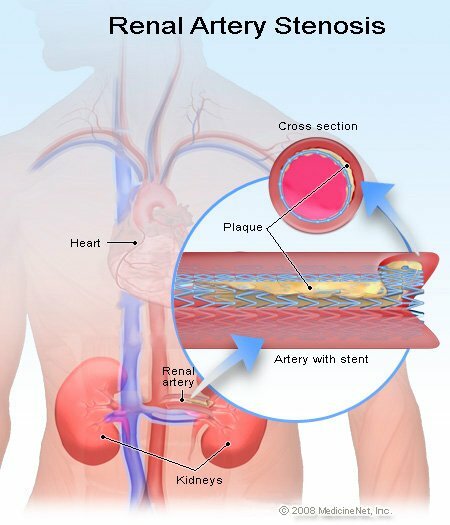 What is the treatment for renal artery stenosis? What is the follow-up for renal artery stenosis? What is the outlook for renal artery stenosis? Aside from filtering blood and making urine, the kidneys have other functions. One such function is monitoring blood pressure (performed by special cells called macula densa). Using a chemical messenger called angiotensin, these cells can help adjust blood flow throughout the body and maintain normal blood pressure. The angiotensin acts by increasing muscle tone in small artery walls to help boost blood pressure. Angiotensin also stimulates the release of aldosterone, which helps the body retain sodium and water, increasing the amount of fluid within the blood vessels. Most people with high blood pressure have essential hypertension (hyper=more + tension=pressure), meaning that the cause of the high blood pressure is unknown. However, one known cause of hypertension is renal artery stenosis (renal=kidney + stenosis=narrowing). Each kidney gets its blood flow via a renal artery that arises from the aorta, the major blood vessel from the heart. If one of the renal arteries narrows, it may cause decreased blood flow to the kidney and to the macula densa (the specialized, blood-pressure sensing cells in the kidney). These cells falsely presume that this low blood flow is being experienced by the rest of the body and that overall blood pressure is too low. They respond by increasing secretion of angiotensin, triggering the body's response to increase blood pressure. High blood pressure is known as the "silent killer." It has no specific symptoms, but over time stresses the major organs in the body and is a risk factor for heart attack and stroke. Blood pressure elevation with renal artery stenosis is no different; however, the decreased blood flow the kidney(s) over time may cause damage to the kidney(s). Decreased renal function (azotemia), may present with symptoms of fatigue, malaise, and/or slight confusion due to a gradual buildup of waste products in the body. Your physician may be concerned about renal artery stenosis if high blood pressure has its initial presentation in a person older than age 50 or in a person under the age of 30. The physical examination may give a clue if a bruit (a rustling sound produced by turbulent blood flow) is heard when your physician listens to the abdomen. If an artery is narrowed, it may cause turbulence as blood flows through the narrowing, causing a noise, like the rapids in a river. This noise is called a bruit. Renal artery stenosis may also be considered a cause of elevated blood pressure if multiple anti-hypertension medications have failed to control high blood pressure. Screening blood tests may be done as part of the general evaluation of high blood pressure and may include a complete blood count, electrolytes, kidney function tests, and a urinalysis. Renal artery narrowing can be detected with ultrasound or computerized tomography angiography or arteriography. Ultrasound uses sound waves to visualize anatomic structures, and with special techniques, can approximate the amount of blood flowing through the renal artery to the kidney. Computerized tomography (CT) will show all the blood vessels in the abdomen as well as the other organs. The intravenous dye used may have the potential to cause some kidney damage. The benefit and risk of each procedure needs to be assessed for each patient to decide what would be most appropriate in a given situation. The decision whether to treat renal artery stenosis with medicine or with a surgical procedure depends on the situation. In patients with renal artery stenosis and only one kidney, if kidney failure from renal artery stenosis is a possibility, opening the artery with a surgical procedure may be the preferred option. Similarly, if there is significant stenosis in both renal arteries and kidney function is compromised, surgical repair may be offered as the primary treatment. If the renal artery stenosis causes less than 50% narrowing of the artery and if kidney function is maintained, medications that block the actions of angiotensin [for example, captopril (Capoten), enalapril (Vasotec), losartan (Cozaar)] may be used in association with routine monitoring of the renal artery status with ultrasound. The most frequently used invasive procedure to open a narrowed renal artery uses the same type of procedure that is used in heart disease. Balloon angioplasty allows a radiologist to insert a catheter, or narrow tube, into the femoral artery in the groin and advance it to the area of narrowing in the renal artery. By quickly inflating the balloon, the cholesterol plaque causing the narrowing is compressed into the artery wall. A stent or wire mesh is then placed across the area of previous narrowing to keep it open. Unfortunately, if the renal artery stenosis is longstanding and kidney function has been compromised for a prolonged period of time, return blood flow to the kidney may not return kidney function. The chance of restenosis is also dependent on the severity of the condition. The more severe the stenosis at the time of diagnosis, the more likely the artery is to completely occlude in the future. Renal artery stenosis is one potential reversible cause of high blood pressure. The diagnosis may be suspected in patients who have hypertension that is difficult to control. Diagnosis is made by imaging the artery with ultrasound, computerized tomography, or arteriography. Treatment may be medical or surgical. Minimizing risk factors is important in decreasing the risk of restenosis. "Establishing the diagnosis of renovascular hypertension"
Please describe your experience with renal artery stenosis. What treatment did you receive for renal artery stenosis?